I have seen a few great films this year, namely Doubt, Synecdoche, New York, and Waltz with Bashir (the last of which I still need to talk about). But, up until this point, I had not seen any GREAT films. That is, a film that rises above being just an artistic achievement and takes hold of your heart. Gus Van Sant's Milk is one of those films. At its most basic form, it's a biopic. 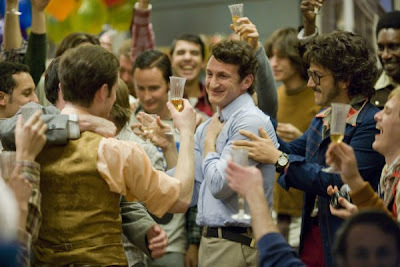 And it may be very hard to make a bad biopic when your subject is the exuberant and life-loving Harvey Milk, the first openly gay politician elected to office in California and a man who helped lead the gay rights movement in the 1970s. So, yes, Harvey Milk is a hero, and a biopic about his life was overdue and, considering recent political events in California, extremely relevant. But, Van Sant's Milk soars beyond the conventions of the biopic, and the biggest reason for that is Sean Penn. I've never really cared for Penn and his bad-boy image, but he does something amazing in this film -- he makes you completely believe that you're watching Harvey Milk on the screen. He makes you understand Milk's ideals; he makes you recognize Milk's personal regrets; and as Milk writes down his manifesto to his supporters in the event that he's assassinated, Penn makes you believe Harvey's every word. It's a hell of a performance, and I don't see how any other actor will be able to take away the Oscar that will be awarded to Penn. Of course, my opinion is biased. Of course, I have a personal stake in this film's message. Of course, as a young gay man, the film speaks more directly to me than it will for others. But, I can't help it -- that's who I am. The things that make up my personality will always influence how I respond to a movie or a person or an issue. I look objectively at Milk and see Dustin Lance Black's compassionate and thoroughly researched script. I see not only Penn's stellar work, but a lively supporting turn from Emile Hirsch, a complicated and disturbed take by Josh Brolin, and a subtle, graceful performance from James Franco. I hear Danny Elfman's wonderful choir-dominated score and admire Harris Savides' sun-drenched cinematography. And Van Sant's unobtrusive yet brisk storytelling. I notice all that objectively, and yet it's my heart -- and all the pain and guilt and fear and self-loathing that I let sit inside me for longer than I should have -- that responded strongest to Milk. It's a movie that was made for me and for the many others out there like me, and thank God it happens to be made so damn well. Unless something stupendous is released in December, Milk is the best film of the year. John Patrick Shanley's Doubt is one of the year's best films. It's an expertly constructed movie in which every moment feels necessary, and it has the wisdom to realize that what's on the screen is enough. This kind of material could have very easily been pushed into messy melodrama, but Shanley holds back, which shifts the focus of the movie from the plot's actions to the characters' moral compasses. It must be noted that I have not seen Shanley's play, and I imagine that those who have seen it will approach the movie with a "been there, done that" attitude. From what I've been told, the movie is very faithful to the play, so I imagine the play's admirers will not get much more out of the film apart from analyzing how the actors' performances differ. But, having not seen the play, I can say one important thing: Doubt works as a movie. At no point did I feel like I was watching the mere cinematic adaptation of a play. This movie moves and breathes on its own terms. It's by no means a large production in terms of the amount of characters or number of sets, but the complexity of the issues it deals with makes it an expansive work. The acting is sublime. 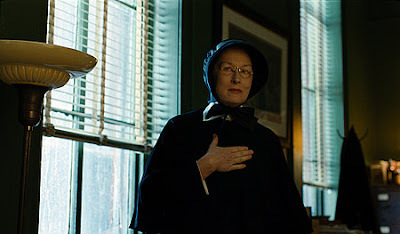 Again, I cannot compare Streep's take on Sister Aloysius Beauvier to the one by Cherry Jones. I'm sure they're different, but different is not necessarily a negative thing. Streep makes Beauvier an utterly believable character -- one that I am certain existed in the film's 1960s era, and the sort of person I know to still exist today. Philip Seymour Hoffman can do no wrong, nor can Amy Adams. And Viola Davis nails her small but vital part. I wish we saw more of her. I will not get into the film's plot, nor its characters' ambiguities. I dare not rob you of the movie's unexpected power. Doubt will hit you hard, and that it accomplishes that by doing so little is the best compliment I could give it. Australia - It just started screening today and responses have been all over the board. It seems like the movie may be too uneven -- supposedly some moments really work while other parts are cringe-inducing. So, it's probably not getting in for Best Pic, but it'll score a ton of tech noms. The Curious Case of Benjamin Button - Many people's frontrunner. The first press screening is tomorrow. I don't know when I'll get to see it, but as impressive as the film looks, there's something off-putting about it too. I'm not quite confident all the facial CGI used to make Pitt age in reverse will convince me, and ever since Fincher switched to using HD cameras, his compositions have looked washed out and unrealistic. Still, much promise here. For now, I'll say it makes it into the Big 5, but it'll be interesting to see the reaction from Thursday's screening. The Dark Knight - It baffles me that people are still hesitant to predict The Dark Knight for Best Picture. It's in. I'm confident in saying that. The movie is too big, too acclaimed, and (most importantly) has made way too much money to be ignored. And Christopher Nolan is well respected in the industry. Expect Best Pic, Best Director, Best Supporting Actor (which Ledger is most likely winning), as well as 3 to 5 tech nods. Doubt - I'm seeing this tomorrow night. Will update at that time. Frost/Nixon - It's a very strong, very competently made film with an admirable turn from Frank Langella. But, I'm not sure it has the muscle to go the distance. It comes off as a fascinating and relevant film, but also as a slight film, and I think people want "big" right now. Gran Torino - Who knows? Never bet against Eastwood, who seems to be on the same wavelength as many Academy voters. Still, the film's trailer makes me shakes my head. I don't think much more than an acting nomination for Eastwood is happening here, but I could be quite wrong. Milk - The current frontrunner from my point of view. I'm seeing it next week, so I can't say for certain yet, but it's a genuine crowd-pleaser from what I've heard. And the passage of Proposition 8 only galvanizes the support for the movie and its message. I'd say it's in, pending further notice. The Reader - Starts screening next week (I'll see it on Wed). Could be a strong contender. Kate Winslet definitely is, as always. But will the fact that the film was rushed to make its December release date be visibly apparent? Revolutionary Road - Hearing mixed things from screenings, but more positive energy than negative. Could very well break into the Big 5, but for now I think it'll just miss. Slumdog Millionaire - It's in. People are falling in love with it. I don't see it winning, but you never know. WALL-E - Deserves to be considered a player for Best Pic, but the Academy is not in the business of nominating animated films for the top prize. Unless Australia, Button, Doubt, Gran Torino, The Reader, and Revolutionary Road all flop, I don't see WALL-E breaking the trend. The Wrestler - Excellent movie, but the praise will all go to Mickey Rourke's dazzling performance. As with Frost/Nixon, the film feels a bit too slight to enter the big race, but it wouldn't be a shock if Darren Aronofsky was nominated by his peers. This is a video of Robert Pattinson (the leading man in Twilight) being introduced for a Q&A at a mall. The lack of updates is not because I don't have anything to talk about. On the contrary, I have too much to talk about -- Obama's victory, Proposition 8, Waltz with Bashir, the Oscar race, Noah and the Whale, etc etc etc. I don't know where to begin, and I don't know when I'll begin. But, rest assured, it will begin. Soon. I think. My PopWatch post on the addictive puzzle game is here. Every year or so, I update the list of my 20 favorite films. Some movies enter the list, some movies leave, and others are shuffled around. My list, as of now, is not much different from the one I had a year ago. I made one notable decision: a film must be at least 10 years old to be considered, thereby proving that it has endured the test of time. This caused "City of God" and the "Lord of the Rings" trilogy to be taken off, but only for now.